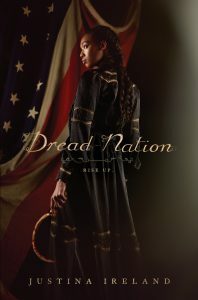 Dread Nation is a new young adult novel by Justina Ireland that imagines what would have happened if zombies had risen immediately following the American Civil War battle of Gettysburg. Kyle takes a look at the history and use of zombies in American popular culture going back to their origins in the Haitian Sugar Plantations. Claire takes a look at Ireland’s writing career, twitter scandals in the YA community, and how Pride and Prejudice and Zombies inspired Justina to write about the undead. Our hosts conclude with their thoughts on the book, its protagonist and the tricky beast that is Twitter. Previous 70: Marsfall – With Special Guests Sam Boase-Miller, Dan Lovley, and Erik Saras	Next 72: The Dark Knight Returns – Claire’s Birthday Spectacular!